Note: Again, these are uncorrected “notes” that I’m publishing live. Sorry for any typos or mistakes. I’ll try to tidy things up later. Day One’s notes are here. And we’re back with day two of the Radio Festival. 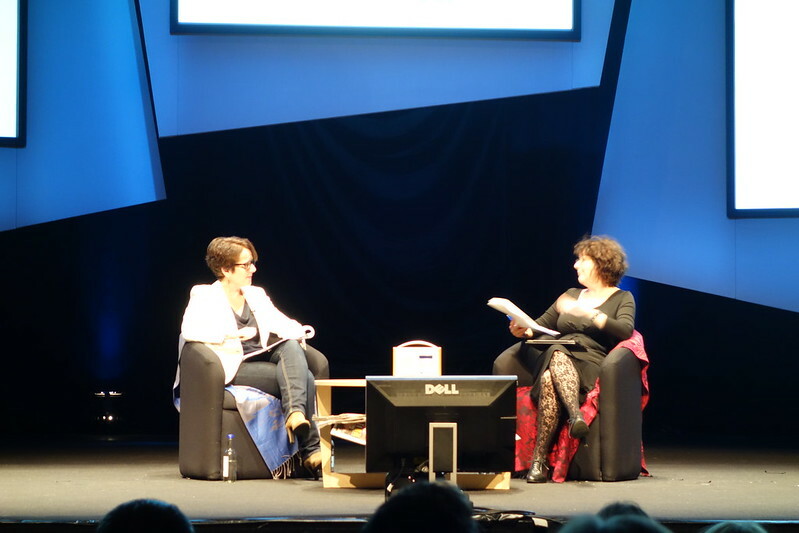 Jane Garvey and Fi Glover are still our hosts in the main auditorium. The first session is an interview with Global Radio’s Ashley Tabor conducted by Torin Douglas. “Content, content, content,” is what is most important to Tabor. But you have to acknowledge that people are listening in different ways. Then we get into the thorny issue of the GMG takeover. Tabor says that they cleared national advertising and programming. But it came down to local advertising. “We were very surprised,” he says. He puts the case that a local advertiser has a wide array of advertising options – local press, the internet, local TV, outdoor etc. They’re challenging on that basis. He says it’s about great people, but yes, they have a brand-led strategy. However that doesn’t mean getting rid of local stations. He points out that a DJ can be in the local area but say nothing about the locality. What’s important to Tabor is what comes out of the speakers. Asked if he’d like to own all of commercial radio, he says he’s not sure if the answer is “yes”! He feels we’re much further along in a digital switchover, and it’s important to get a positive message from government at the end of this year. In that respect he’d echo what Helen Boaden and Dee Ford said yesterday. He’d like to hear government say that DAB will be the dominant listening platform going forward. Tabor says that he can’t currently say with confidence to someone that they can get their local station on DAB outside London at the moment. Once build-out happens, he can. He talks about the importance of DAB in cars, and he’d like DCMS and DFT get together to help move things along. Tabor sings the praises of Tim Davie in pulling the industry together. In general terms the BBC is good a thing. It’s well funded and occupies lots of space. As long as it makes distinctive programming then that’s good. We watch a Nick Clegg video made for LBC’s recent 40th birthday. A good gag about the cabinet! Torin Douglas wants to know what plans Global has for LBC. Tabor is very happy especially with the shows that have politicians like Nick Clegg or Boris Johnson talking to the voters. Turning to Capital, he thinks that as long as we keep innovating, radio can endure. Capital’s 10-19 numbers are up massively he says. He’s very excited about Capital Xtra, and these just show that you need to be proactive in today’s world. 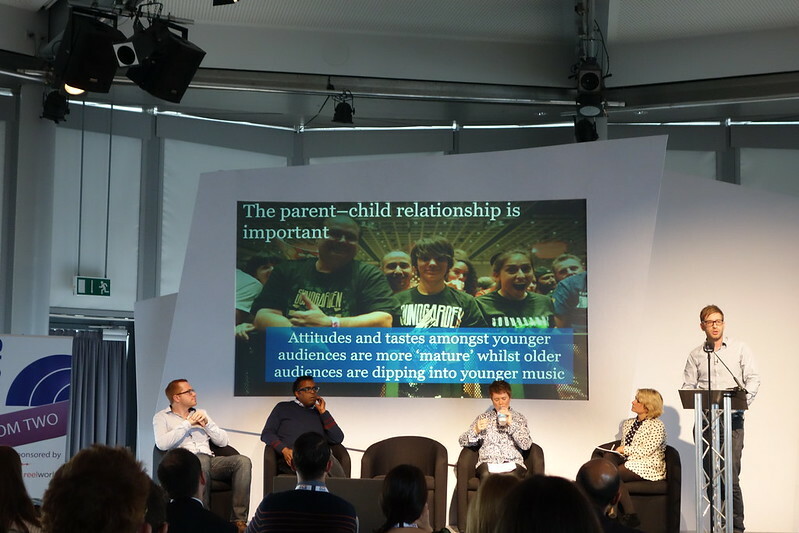 Tabor believes that the big events like Summertime Ball and Jingle Bell Ball are important parts of making sure that the brand is relevant to young listeners. He also wants to mention other events from Classic FM to Xfm – they do a broad range of events at Global. Asked about the talent management side of the business, Tabor thinks that the two are linked. “The Wanted’s new album is out on November 14th,” he jokes. Douglas tries to draw in what Charlotte Church talked about yesterday, and women in the business. Global employs people on the basis of skills and nothing more. He doesn’t like getting into numbers, and he wants to try to concentrate solely on skills. Global has an academy and wants to bring young people into the industry. They have some plans that they’re not ready to announce quite yet. He wants to create a path for those who don’t have a way into radio through knowing others and some of the other sideways routes. Asked about his own habits, he says he likes to listen to lots of different stations – both his own and competitors. He chooses his radio based on mood. He says he’s immensely proud of the radio they produce and that drives him. He says that if he ever wakes up and doesn’t relish it, that’s the day he should stop! Geoff Lloyd from Absolute Radio introduces a session called Deal or No Deal. To set the scene he points out that in the first half of this year the IAB said that £3bn was generated in the first half of this year, compared with £260m for radio. 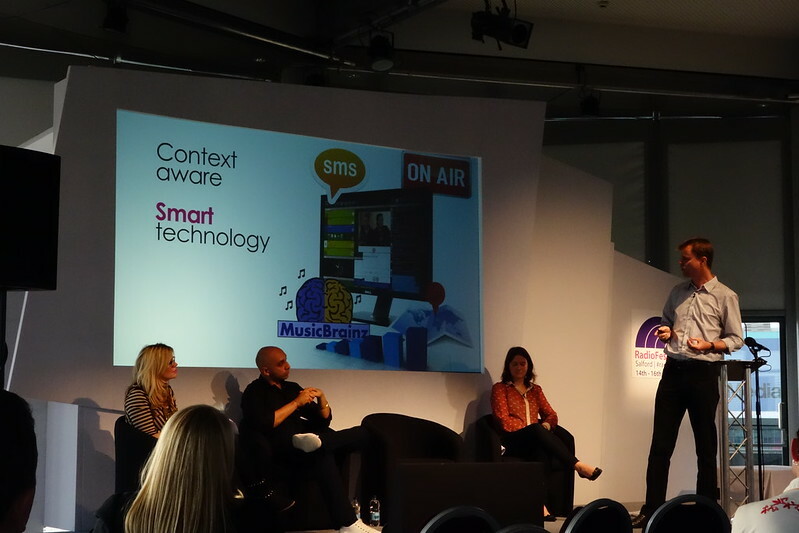 Paul Davies of Microsoft, Kelvin Tillinghast of the Saga Group and Mick Style of MEC Manchester are on the stage. Davies talks about the challenges that a company like Microsoft stand out with so many massive competitors. He says that they’ve moved away from spot advertising and towards deeper brand engagement. Tillinghast says that radio is one of the few places that a creative writer can ply their trade – copy elsewhere is getting shorter. But he says that radio has become a “dumping ground for business need.” There’s hardly any space in radio advertising now. He describes legal disclaimers as an “epileptic vomit.” Style says that radio is powerful medium for brand endorsement. He talks about Netflix’s sponsorship of afternoon drive on Capital. He’s really pleased with the way it can be so integrated into the fabric of the programming. Lloyd wants to know if radio is able to provide the innovation. Davies says it can be. It’s not easy – but it’s the kind of stuff that cuts through. He highlights a recent MS Office campaign that got kids to use Office software to do a project on what they wanted to do. He thought it was interesting that you could use audio to emotionally drive something quite visual. Why are almost all radio ads terrible Lloyd wants to know! Tillinghast says that traditionally TV and press were the primary media. He thinks that the briefing is wrong for radio creatives. Time is also an issue he says. Once upon a time, a creative could disappear for two weeks, whereas they’re lucky if they get a day nowadays. Style says radio is unique in its flexibility to use branded content. It can be fast, and there is still plenty of potential. Davies admits that traditionally you have started from a 30 second TV spot. But that’s changing and clients are waking up. Today you’re likely to get all disciplines in the room and you look for a big idea. If radio can get a seat at the table, and that’s how you can move on. There does seem to be a consensus amongst the panel that you can’t think of single media alone, and social media can be the glue holding some of it together. Lloyd wonders whether ad agencies are “wiser” spending money on services like Spotify because people want to hear that music. Style isn’t sure that’s true. There are benefits because of the real time response. But the scale is still much smaller than radio. He notes that their revenues are a fraction of overall commercial spend. How do we inspire creatives to want to make good radio ads rather it being something they knock off before going to the pub. Tillinghast says that if you want to win awards, the easiest category to win awards in is radio. He judged a radio award category and got it down from ten hours to thirty minutes very quickly because there aren’t that many good radio ads. He notes that South African radio ads are really good because radio is more important. Davies says that blockers for radio are “you can’t see it” and accountability. But it’s the same for TV where like all advertisers, they waste lots of money. But he notes Sky is launching their service. And if TV is figuring that out, then radio needs to. Up to room two now for “The Art of Storytelling” with Laurence Grissell. He’s talking about stories and how humans react to stories. Good stories cast a spell – he says. He opens with a tease and acknowledges that we know we must have a structure that we know won’t reveal everything at the start. Newspapers or much of the internet doesn’t do this. We don’t like the ending being given away. And in today’s age, that’s still the case. “After food and before love, stories are vital for the survival of the species,” says an American feature maker who’s name I didn’t catch. There’s also a nice audio clip with Steve Punt talking about the best selling postcards in the Tate – which led us on to “The Crying Boy“. It’s probably worth going away to listen to it, rather me trying to paraphrase it here. He notes that the accompanying video has reached over 100,000 views on YouTube. It has spread to Russia and Brazil. Stories are universal. Music is also an important part of the subtext. We hear the Jaws music. Grissell notes that when he watched the film again recently, you realise that the mechanical shark is the most disappointing part. The imagination is better. We hear a Jarvis Cocker clip that says the same thing. But if you play by the rules of storytelling, the truth doesn’t always matter. We’re sometimes imposing narrative on sequential events. For example, how much of something like Google’s success was luck? We attribute its success to its brilliant founders. But in reality there’s luck involved. We hear a clip of German programme maker Jens Jarisch who talks about stories as a container. And these rules work for radio stories. Grissell uses La Traviata as an example of an ending. He draws on another of his series “Don’t Log Off” and illustrates endings. Online and in papers, stories “dribble to an end.” But we can end them properly in radio. An audience wants a story with twists and turns, and if it’s a good one, they’ll stay the course. We don’t want to know the ending right at the start even in today’s world. We’re willing to wait. And I should mention that whoever made Jon Holmes “entry” video deserves credit! And I’m looking forward to hearing the piece that Simon Elmes has been recording and editing during the Festival. Back in the main room, it’s a session on youth with Charlie Sloth hosting the session. 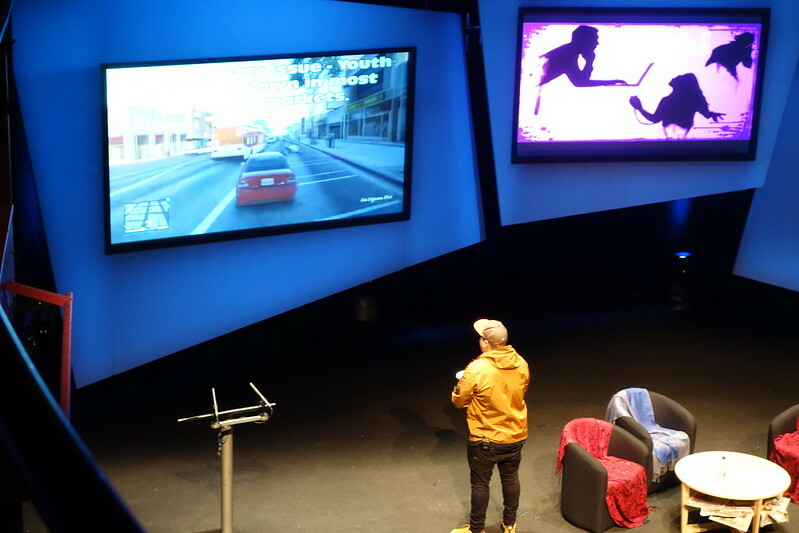 He begins “playing” GTA V with some facts about youth listening on screen alongside. Ben Cooper is first up in this session to talk about “Radio and the HD Generation”. He starts off wondering if the last thing we see at night is our phone? Everything Radio 1 is doing can be summarised as listen/watch/share. In the last month 10 people clicked every second on some Radio 1 content on their YouTube channel. Bastille sessions – Kanye West interviews – Greg James version of the “Wrecking Ball” video. And Radio 1 has an iPlayer channel coming soon – but it’ll be for their home made content. It won’t have videos and be a competitor to Capital TV. Radio 1 and 1 Xtra will have “Social Media DJs” to just look after their social media. So rather than asking programme teams to do it. Cooper believes that this is how they’ll got onto that important screen and survive this HD generation. Then Andy Roberts of Kiss joins Cooper on stage. Roberts says that “radio” is an old fashioned word for his audience. 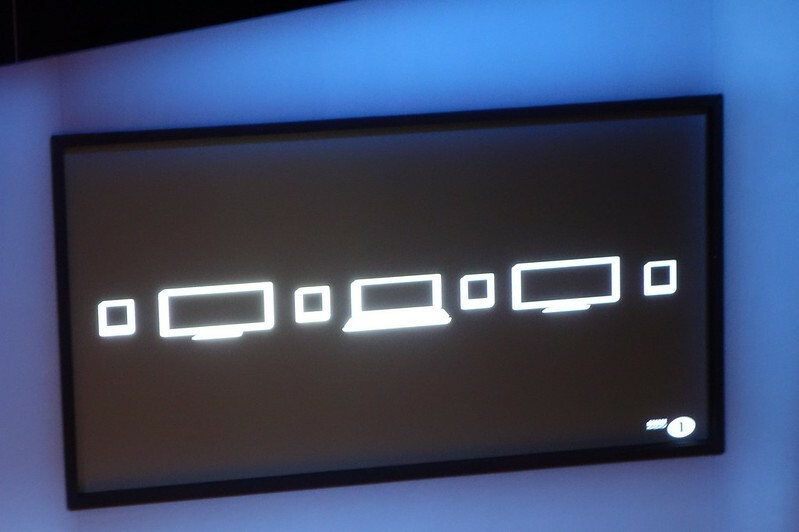 But it’s a challenge with commercial radio getting content onto the devices where people want them. But commercially it’s less about spot advertising. Sloth wonders why an advertiser would even use radio when it’s so cheap to advertise online. Roberts talks about the scale you can get. There are challenges, but that’s why ideas are important. Cooper says radio isn’t broken and it’s still very successful, but there are indicators that the direction is changing. But there are still 11m people listening to Radio 1 every week. We get doom and gloom because the media is always interested in the next big thing. Cooper concludes by saying that they’ll continue to sell their stories but do it on new platforms. Back upstairs (I know, dear reader, that you want to know about the layout here) for a session called Ask the Audience with Lucie Cave, editor of Heat. 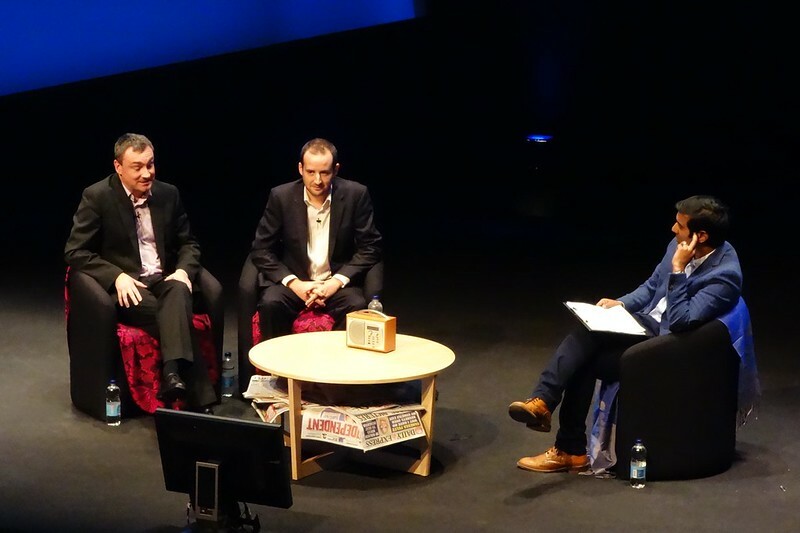 On stage are Kim McNally and Patrick Collins from the BBC, Cliff Fluet of Lewis Silkin and Martyn Lee from Absolute 80s. The session is about how we use and discover music today. McNally and Collins are showing us some research findings about how music tastes and behaviours are changing. Today there is a lack of a dominant media for shaping popular music today. Music is a commodity with lots of choice and access. There are some very different ways to discover new music from TV and Shazaam to YouTube. And there’s a greater need for shared live experiences. Amongst 35+ audiences, this could be without actually going to the live event. But there’s also a greater need for guidance – trusted gatekeepers. McNally says the this is an area that BBC Playlister can help out with. The charts are also devalued these days. YouTube views are much more important for many young teenagers. It’s the young teens who really need to know who is actually number one (Has One Direction beaten Rihanna?). The younger audience doesn’t specialise in a single genre. They’re less divided than audiences perhaps once more. 25-45s are more genre specific, but tastes broaden over time. The “Eclectic Mainstream” still enjoy discovering new artists. While the mainstream stick to more familiar fare. While the research didn’t measure size, the former group are likely to be smaller, although growing. 45+ audiences are divided into those who are more open and like being in touch, but could be more niche. People are experimenting later into their lives. You have to reach 70+ before people get really closed about their musical tastes. We were shown a video of some younger and older listeners explaining some of these things. Then Collins talks about the parent-child relationship. He talks about cross-generational artists like Adele, Jessie J, Elbow, Snow Patrol and Ed Sheeran. There is some evidence of dissatisfaction about “samey” music. And people find it much harder to express what they like in terms of genres. There is so much crossover. Collins mentions in the past going to HMV and having to determine what category an artist might fall into. Urban in particular is a genre that people can’t really explain. Another video expresses this more clearly. But this can mean that it’s hard for radio stations to talk about their music if nobody’s clear about genres. However you can instead match moods and tlak about music in that way: uplifting, melodic, relaxed, dancey. A nice chart that shows how different groups still find music (and it’s more than discovery). He notes that a lot of people complain about algorithmic recommendation systems. They’re not good enough at the moment. Martyn Lee is next up to talk a little about Absolute 80s and gives a bit of history surrounding the station. He explains how as time went on the playlist differentiated further from the kind of music that Absolute Radio would have played – you’ll get 80s cheese on a Saturday night. He talks about defining the audience in terms of their musical interest rather than the commercial imperative of 25-44s. He also explains how they’re not trying to make it sound like a station would have sounded in the 80s. The presenters were not broadcasting in the 80s for example! 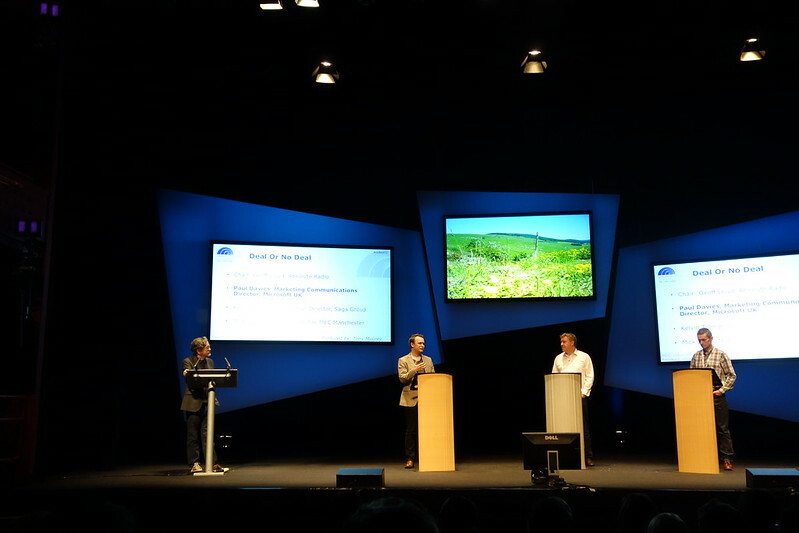 Cliff Fluet tells us that digital music services are audio and not radio – radio is a lean back medium while a jukebox isn’t radio – it leads to “the paradox of choice”. But services are moving towards new models that claim to be more than algorithms. So beatsmusic is one to watch according to Fluet. And data will be unlocked from companies like Pandora, iTunes (via Genius) and Spotify who have acquired Tunigo. Then there are contextual experiences that can add things like the weather or determine playlists based on mood. Last.fm sought to understand the wisdom of crowds and to try to surprise you. We’re implored to download Swell which pulls down podcasts and it’ll programme a whole stream of radio. But it looks at how quickly you start listening and determine what you like. The idea is to make it easier to lean back. Fluet is disappointed by how much radio has used Facebook and Twitter. He notes how its being adopted by TV. Once you add all these elements together, and you start to become a lot like radio. So radio can still dominate in a world where we’re moving closer together. Online advertising has done so well because of knowing who we are. 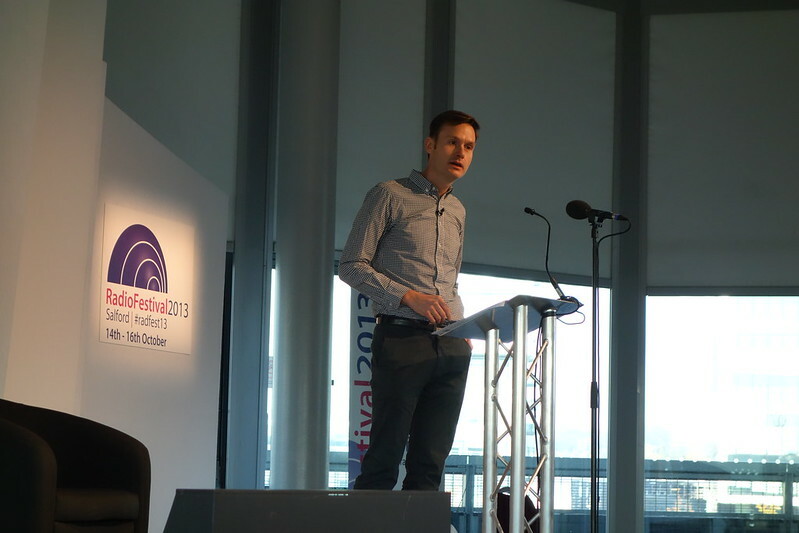 Fluet like the BBC’s new Playlister – and he thinks it could do for radio what iPlayer did for TV. Before the lunch break, we got an excellent Radio Remembers video. After a break, we’re back and in the main hall where Richard Bacon is leading a discussion on Trust in the BBC. And it’s live right now on Five Live. So you might as well listen live rather than trust in the accuracy of my note-taking. 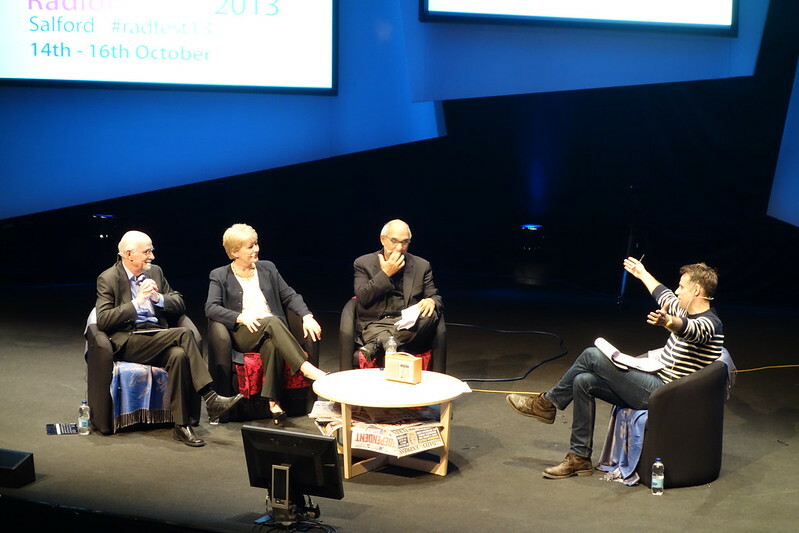 Alan Yentob, Trevor Kavenagh of The Sun and Belinda Allen of Celador Radio, are on the panel. There are also listeners in the room who’ve brought their opinions with them we’re told! You’ll note I’ve not been attempting to summarise this session – but it is very lively and we’re going to run out of time. Worth a listen back on iPlayer if you missed it. 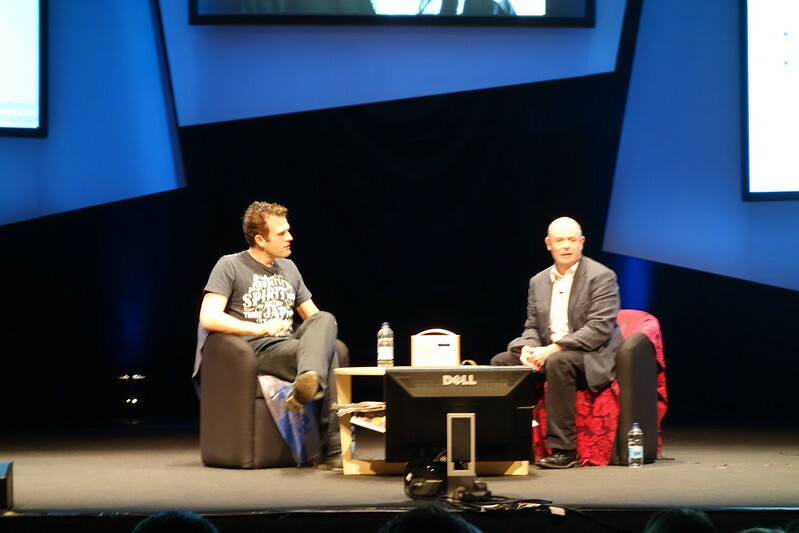 In summary, it was an entertaining hour well managed by Richard Bacon. To be honest – I thought that Belinda Allen was a little surplus to requirements as the she didn’t even get to say anything for half an hour. 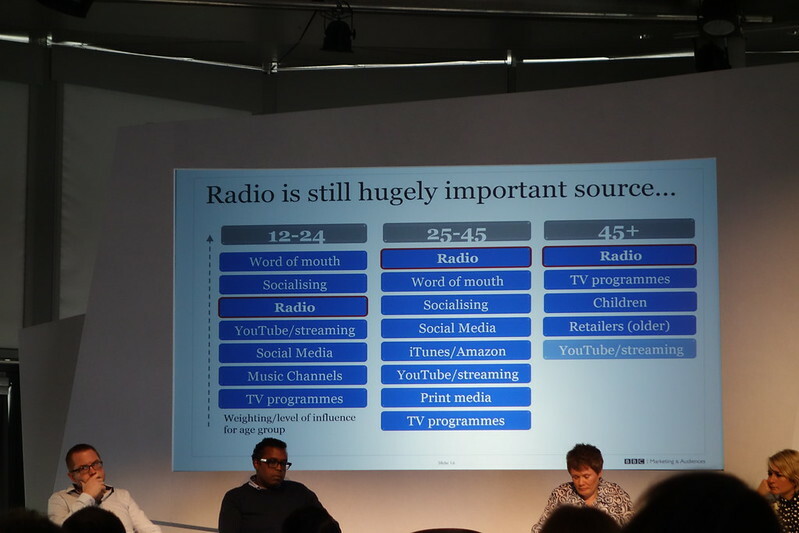 I guess – in reality the discussion wasn’t actually about radio. It was about TV and the management of the BBC. And I think that Kavanagh was sent home with his tail between his legs! The next session is 5 Live v Talksport with Jonathan Wall of the former, and Liam Fisher of the latter. Nihal is in the chair. Wall is asked about the point of 5 Live Sports Extra which he defends with particular respect to cricket. Then Nihal asks about Colin Murray and his recent move to Talksport. Wall claims it was down to him having a wealth of presenters and essentially Murray was third choice. So he had to move to get more work that he wanted. Nihal’s next question is about the overlap between the two presenters on breakfast whereby one of them comes in early and does an hour on their own. Wall says it works for them. Next Nihal asks about the lack of women on Talksport (there’s one). Fisher replies that he’s increased Georgie Bingham’s shows since he’s been there, and there are also people on Colin Murray’s new show. He also said that there are females both sides of the microphones on the station. Wall says that he’s reflecting the country, and runs through having Ian Wright, Adil Ray, Phil Gayle and Aasmah Mir. He says that they do scout for talent. He says that they have a plan – although Nihal presses him on exactly what the plan. Fisher says he doesn’t have a plan. He admits that there should be more black and Asian voices on the station. Roni Irani left the breakfast show. They will look for opportunities from ex-footballers. But Nihal wants to know why they don’t have a plan. Fisher says that 14% of their listeners are members of ethnic minorities. That’s beyond the national average. Fisher is jealous of the BBC’s resources – they have to get every drop out of the resources they do have. He’d take Robbie Savage! Wall is full of respect for Talksport for getting some of their new signings. He thinks that they could take the next creative step and work with indies. There’s a bit of jousting about indies, but Wall reckons that some of his top shows are from indies. Fisher thinks that if he was running 5 Live, he’d shout more about the news elements of the station. Wall retorts with Question Time Extra Time, Sunday Politics, but he says that they’re trying to do more. On sports rights, Wall said they can’t do everything. They have four of seven Premier League pacakges. Talksport had Lions rights. 5 Live dropped NFL which Absolute Radio picked up. They can’t do everything. Nihal says Richard Park want’s to “bury” Kiss by starting Capital Xtra. Who does Fisher want to “bury”? Fisher says at times the BBC and himself will go head to head. They have to make sure they sound different. But they can push to the times outside the coverage. So tonight they don’t have the England game, but they can do programmes before and after it. Can you “bury” your competition with rights? Fisher says that he has to be sure that he can monetise the rights. Wall says that it can be about reputation. 5 Live want more football. Talksport can shout about phone-ins. When Absolute Radio gets in the game it’s a big spend. Wall also says that they were complacent before they had competition. The biggest competition at the World Cup next summer will be getting under 35s to listen to football on the radio. Nihal says that Asian Network is doing quite well there! Nihal is very disappointed that everyone really likes the pair of them! One thing that does come out of this session is that Nihal can be a very punchy interviewer! 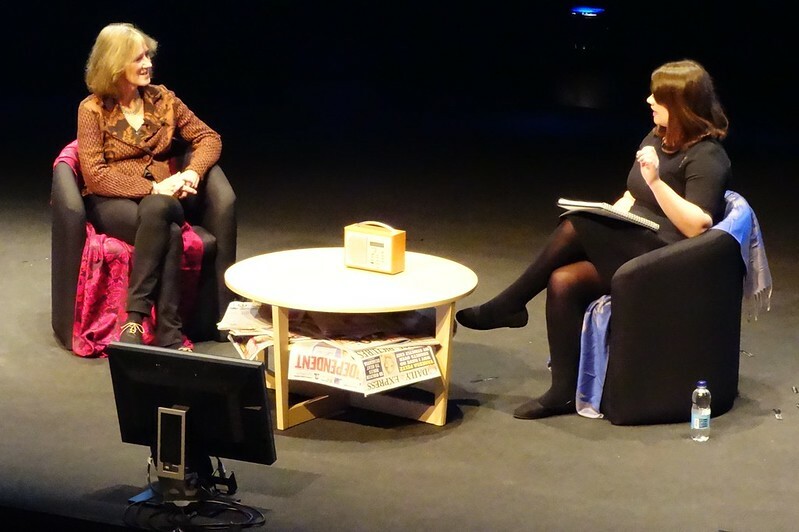 LBC’s 30 Under 30 winner Caroline Allen is interviewing Gwyneth Williams next. She tells us about how she listens to the radio through the day, and having grown up in South Africa, listened to a lot to get the news. It might be a cliché but it is a privilege to work at Radio 4. The collection of talent is fantastic and hugely enjoyable she says. Asked about getting another woman on the Today Programme, Williams says that they’ve known for a while that they needed someone else. And she’s thrilled to have her as well as being well timed. 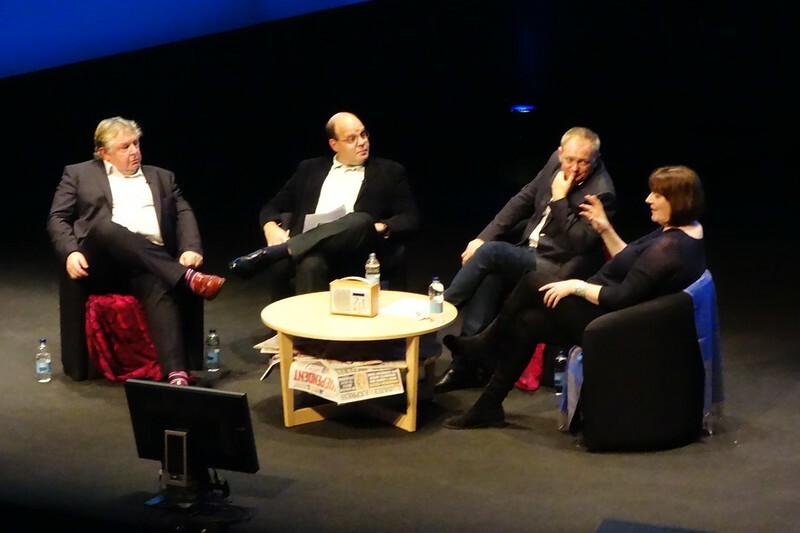 But it was a long discussion, because everything on Radio 4 is a long discussion. She doesn’t think the audience is conservative. If it’s thoughtful then it works. She references Jim Al-Khalili’s show. She misses being able to keep her hand in and make programmes. The BBC Blue Room is here at the Festival and I had a nice look at both iTunes Radio (which I’ve not seen in the flesh) and the remarkable camera attached to the new PS4. There is some significant technology in both the new PlayStation and Xbox. I came in late to a session called What the #$!? about what you can and can’t do on the radio. I came in with the discussion, led by Mark Lawson, talking about apologies. Nick Ferrari mentions some of the language he hears on the Afternoon Play! Paul Smith talks about the general use of language can cause offence. If something is “schizophrenic” you will get complaints if it’s misused. Shelagh Fogerty says that after the infamous Rage Against the Machine incident, they had more complaints about Fogerty telling people to vote Joe McEldry got more complaints. The entertaining discussion turns to an apology that Robbie Fowler made about saying two players were “fighting like girls”, and in general the feeling was that he shouldn’t really have needed to apologise, and at another time, there’d have been no need. Lawson wonders about some of the gags on I’m Sorry I Haven’t A Clue (e.g. “Countryside: The murder of Piers Morgan”). Smith says that people do know what to expect those programmes. SO people understand what the joke is. The conversation turns to “Ding Dong the Witch Is Dead” following the death of Margaret Thatcher. Ferrari thinks that they shouldn’t have even played the short excerpt that they did trying to put it in context. Fogerty also found it uncomfortable and would have not played it at all. Ferrari seems to think that the BBC is as full of lefties as Trevor Kavanagh did earlier. Smith tries to explain that many of the younger listeners to Radio 1 wouldn’t have known who Thatcher was, so they had to try to explain it. Lawson wonders if we’re always protecting the most sensitive. Smith says no – you’d play nothing. But you have to consider everything most of the time. And in particular you have to think of children. Lawson finds it astonishing that the BBC thinks about what plays go out in the afternoon when it’s half-term! (I thought we all knew that). Upstairs Dan McQuillan is mid-way through a really good sounding talk on using social media on the radio. He’s telling us about some of the tools which do sound awesome. Otherwise I sadly missed Alison Winter and Tommy Sandhu’s pieces. Emma Barnett wraps it up! 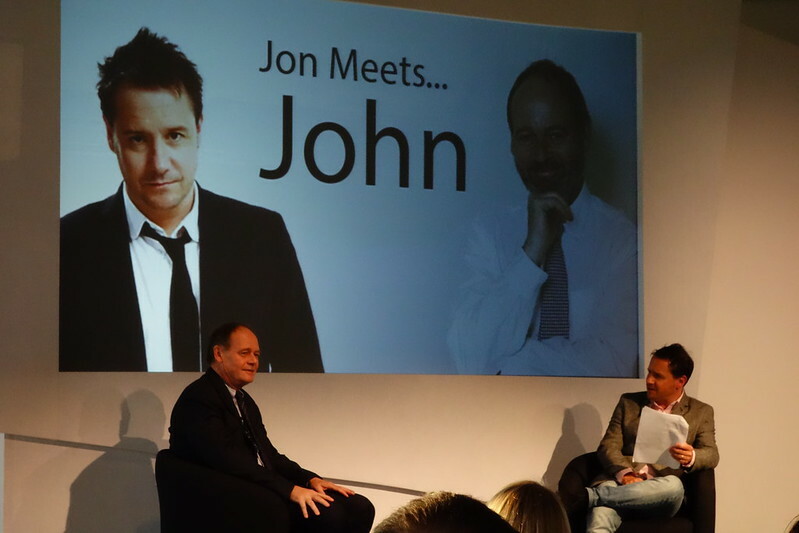 The final ssession see Jon Holmes interview John Lloyd. Another session I’m not going to attempt to summarise. Is it because I’m flagging at the end of two days of note-taking? Partially. Is it because it’s really hard. Yes. Is it because, the jokes would get lost? Yes. So I’ll sign off now. Hope these notes have been useful.